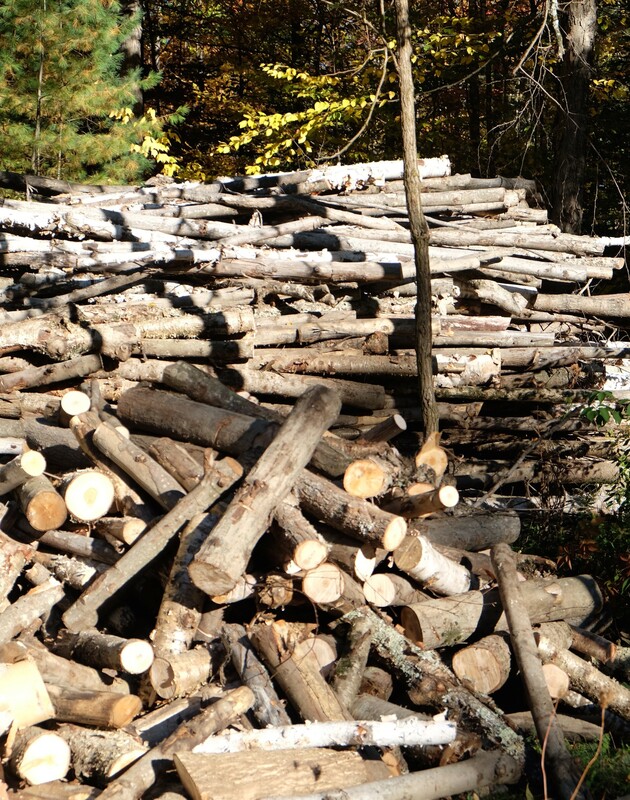 There were two old men standing by the woodpile at a farm on the outskirts of Brant Lake. Nearby, pumpkins, waiting to be harvested, decorated the field with orange hues. Green and yellow gourds, stacked next to a cluster of cornstalks and a friendly stuffed scarecrow, dressed in blue denim overalls, completed the autumn display. Summer had vanished but a beautiful fall had entered, painting leaves a myriad of bright shades. I knew one of the men, Alex, who, for many years, worked as a logger in the woods behind Lily Pond. He often parked his gray pickup in town near a plaque commemorating Jud Barton’s old grist mill. In recent times the dented truck, with a rifle hanging on the back window rack, was filled with hardwood logs, but in the 19th century loggers cut Hemlock and stripped the bark to be used in the tannery on Tannery Road. Alex looked up as I approached, waved, and shut off the chainsaw. Sweat dripped from a face as rough as the bark of the trees he cut. His gray beard was a refuge for sawdust that had sprayed from the sheared logs raised slightly on a supporting log. I hesitated to interrupt his work but he seemed to relish the opportunity to pause in his attack on a pile of logs twice his height. And Alex was a tall man! And, I thought, that challenge must have given Alex a feeling that he had control of his world—at least the world of logs. I often passed the Widow Burke’s house when I came off the path to Grassville Road. It was a converted trailer that sent off a cloud of smoke each winter day. Everyone helped the widow. That was the nature of people at Brant Lake. With a shrug Alex slowly lifted the heavy saw and as I left I heard his voice rising above the clamor of the chainsaw. I have also entered the golden years and I reflected on Alex’s words, as dry leaves crackled under my hiking boots. The gold may seem a bit tarnished but the sound of the chainsaw was the echo of life. Every log Alex split was another victory for an aging lumberjack who had seen many autumns. And each log symbolized another day. October 30, 2016 in Brant Lake. If I join you, it could be three old men. moving because it is so simple! !